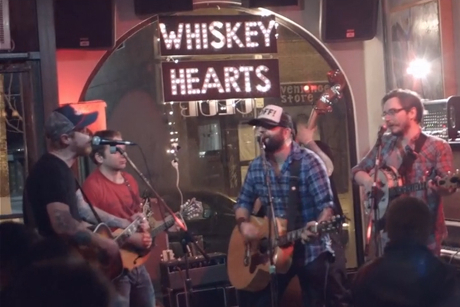 Whiskey Hearts aren't a band, but rather a collective of Toronto musicians who play what they call "punk-inspired acoustic rebel music." For a taste of what this means, you can watch a video for their song "So Cold." The clip shows the tattooed members of the old-time folk band performing at the Press Club in Toronto, where they perform on the first Saturday of each month. During the vid, Whiskey Hearts pluck their instruments and pepper the sprightly tune with group shouts. This song will appear on the collective's debut 7-inch single, due out June 11 via Stereo Dynamite Recordings. The single also features "Got Away." Pre-order a copy here, or listen to the songs on the band's website.